VMWP’s Rick Williams and Elaine Uang will be presenting at SV@Home Affordable Housing Week. El Camino Real is the thread that unifies the San Francisco Peninsula and Silicon Valley. Connecting 18 core communities (including 8 in Santa Clara County), ECR is the overlooked heart of the region. Yet ECR is also the key to the future of Silicon Valley. The last decade has seen the decline of strip retail and the repositioning of scattered retail sites into vibrant mixed-use communities. 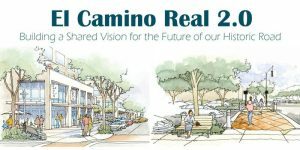 If we can take advantage of El Camino Real’s 1600 acres, we could yield homes for up to 160,000 families on El Camino Real in the next four decades. If only 15% of these potential homes are affordable, we could provide housing for 24,000 of our most vulnerable families. Today, ECR functions as a divider, both physically and politically. It is a monoculture designed around the automobile and hostile to residents with different abilities and those who require alternative modes of transportation. How can we rethink El Camino Real from a corridor serving the most vehicles per hour to one centered around serving the most people? How do we make the precious space of the El Camino corridor work for residents of all incomes? Mountain View, Sunnyvale, and Santa Clara are currently articulating community visions and planning their pieces of the corridor. The jurisdictional approach is achieving fast results on the ground, but will a patchwork of separate regulations driven by local politics achieve a cohesive vision? How will regional concerns such as transportation be integrated across borders? Our panel will grapple with these questions as they articulate the future of our most historic road.